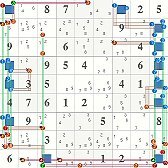 Rather than using Knuth's Dancing Links (DLX) implementation of his Algorithm X to competely solve a sudoku puzzle, I am instead going to discuss how to use DLX to generate all possible covers sets for a given base set. 3) Basic knowledge of C/C++ and STL is important, but not necessarily critical. The base/cover algorithm requires some outside method to discover/generate a base set. Currently, I'm using doubly-linked ALSs to generate a vector describing all the cells of both ALSs, but you can use whatever technique you want to generate such lists. However, the following code only works well for rank-0 logical structures, so if you want rank-1 chains etc, you'll have to adjust the filter to allow base+1 sized solutions, modify the elimination code to correctly test the overlap counts, and probably switch from cell base sets to lists of the actual sets used to link candidates. 1) Find any interesting set of cells to examine. This becomes the base set. 2) Setup the DLX problem using the libexact (modified) API. 3) Execute libexact exact_solve to find all valid combinations of rows/cols/boxes that exactly cover the base cells. 4) For each solution, any outside candidate contained in a cover set but not in a base set can be eliminated. This is similar to fishing algorithms that use base/cover sets for single digit analysis. In fact, I adapted it from my experimental fishing engine that also uses DLX in this manner. Here, it is being used in a more general fashion. If there is any interest, I'll post the modified libexact code as well as the driver code that takes a set of cells and generates multiple calls to do_base_cover for all possible combinations. I'm hoping other programmers will become likewise interested in coding better base/cover analysis code that we can all share. Obviously there are many parts missing, but this is just a "teaser" and I'll release all the code embedded in my testbed ALS engine along with the code to generate sud case collections. Makefile.txt needs to be renamed to Makefile and all the others need to be placed in the same directory for correct building. I'm now using the mingw compilers under cygwin, so this should build correctly on just mingw. If all goes well, you should match (use "tail -16 royle17.log") the following statistics for the updates/call and % eff. The others depend upon the speed of the processor, but should be similar if normalized. I don't have a really fast cpu (old AMD X2 4200), so the above batch run takes somewhere between 12 and 15 minutes depending on what else I'm doing while the test is running. I use cygwin and the WXDevCPP MinGW IDE. I'll post instructions on how to download these as soon as I can figure out a minimal install. Alternately, you could just install the full cygwin package, but that's really overkill unless you want to play with X-Windows, which is actually very cool and really makes you feel like you're running a Posix OS. For those who may have generate the above royle17.sud file and attempted to directly load it into Xsudo, it won't work because there are 62561 cases in one file. To circumvent this and to match Allan's new 2000 case limit, I have a small program that reads large sud collections, sorts them based on the keys that I have internally stored in the collection (see write_xsudo), then breaks them up into multiple 2000 max chunks. 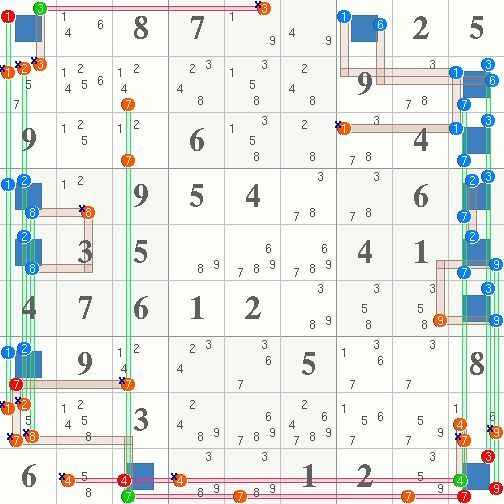 The cases are sorted by descending number of eliminations, ascending number of base cells, ascending puzzle number, and ascending step within puzzle. The first one contains the (debatably) more interesting ALSs/DBs. The eliminations are flagged with a small "x" so it is easy to check whether or not the base/cover algorithm agrees with Allan's Xsudo found eliminations. There is a deliberate "bug" in capturing the exact grid position so sometimes there are many eliminations listed that were found due to prior ALSs/DBs. The following editors are optional if you have some favorite Windows source code editor. Otherwise, I recommend at least trying Vim or Joe. This is a very nice/free IDE for developing Windows C/C++ applications using the MinGW framework, but there's a steep learning curve if you really want to code using wxWidgets. I'm using this to develop a sudoku helper (not a solver), but it can compile the testbed pretty easily as well. If anyone is interested in going this route, I'll post details on how to setup the project. There was no response/interest on the Players Forum, so perhaps I should have posted here first? Regardless, there are many discussions on the Players Forum that include various base/cover diagrams. So for the highly self-motivated individuals, I recommend studying any (if not all) of Allan Barker's postings. It's the implementation of his theory that I'd like to explore from a design/coding POV. I feel compelled to issue this disclaimer: My ALS engine is not intended to be used as a solver. It is a testbed for locating various types of ALS chains and Death Blossoms and investigating the associated base/cover logic. Solving a puzzle to completion, while interesting and often possible, is not its main mission. The included techniques are present to bring puzzles to a known quasi-SSTS condition for large collections and/or puzzles not otherwise presented as PM grids after SSTS. With that proviso having been disclosed, it is still extraordinary how powerful ALS/DB can be in terms of solving puzzles without resorting to other higher level techniques. The example ALS chain r1c1 -1- r1c7 -16- r234569c9 -4- r9c3 -7- r1457c1 produces only 2 eliminations from the standard ALS rules. But when subjected to base/cover analysis, the ALS structure as a group produces 13 additional elimination just from my ALS engine's simple base/cover algorithm. Allan's Xsudo finds an incredible 27 eliminations and 3 assignments from the same structure. This pretty clearly demonstrates the "power" of Allan Barker's set/link-set theory. The ALS engine will create the alschain_001.sud file containing all the discovered ALS chains for analysis in Xsudo. For the adventurous, experiment with various -B<n> sized chain limits to see the impact of restricting ALS chain length. The valid values for -B range from 0 for chains with 2 ALSs to 32 for really long ALS chains with upto 34 ALSs. It appears I'm rather late stumbling over this thread. Thanks for posting this stuff up as I'm currently looking at Death Blossoms myself. I've found that discovering the ALS's and matching up potential stems is easy, but the slow part comes when testing the various combinations of stem cell/petals to see which are valid (i.e. no overlapping cells between ALS's) and which produce any useful eliminations. I think I'm going to have to re-read your posts a few times in order to gain even a small understanding of how it all fits together but it certainly looks very interesting! There has been no activity/response for this thread (other than yours! ), so I have not kept the code current with my latest implementation of base/cover logic ala Allan Barker's SLG theory. If you are just interested in ALSs and DBs, then the base/cover logic is probably overkill anyway and the pascal version is more up-to-date with my full solver.